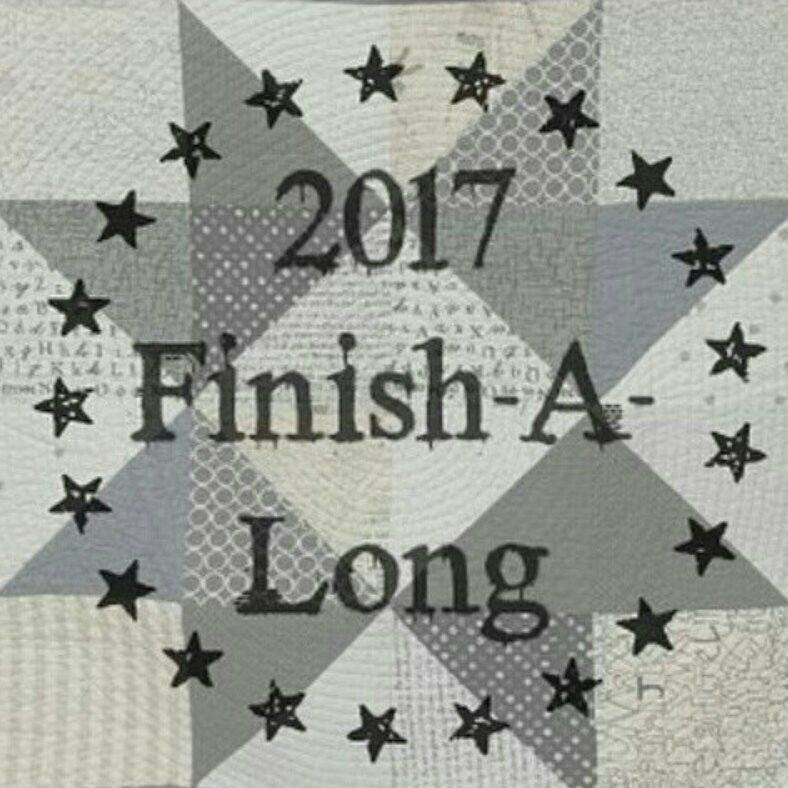 As part of my goal to stay on track and finish projects last year, I joined the 2016 Quarter Four Finish-A-Long Group. The FAL was great motivation to finish projects, and I was relatively successful. The Finish-A-Long was such a success for me, I decided to participate again this year. 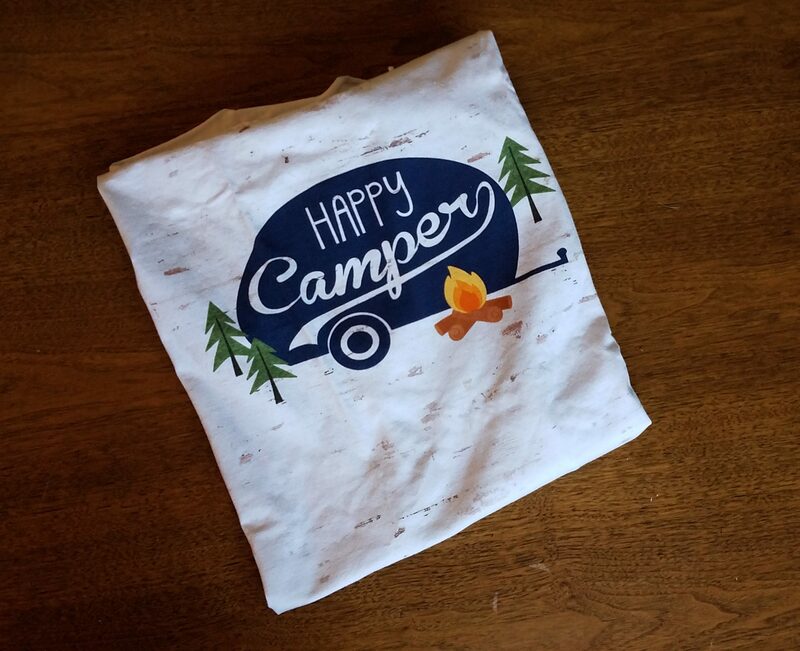 If you are interested in catching up on my entire year (so far), read my posts for Quarter 1 and Quarter 2. I was feeling really discouraged because I didn’t feel like I accomplished many items on my list from Quarter Two, but then I realized I actually got sixteen finished (!!! ), and most of them where while I was still non-weight bearing following knee surgery. The first 10 finishes were all part of one larger project – the girls’ dresses for my daughter’s senior class for their May Day Celebration. The other six finishes were all Patterns for Pirates shirts I made myself and posted on my Instagram. I am really excited to participate in this blog tour! Todd and I rarely do anything that requires us to dress up. In addition, I am NOT a dress-wearing girl, so I don’t own very many. We are attending a Four Course Meal and Wine Pairing event in July, which gives me the perfect excuse to make myself a fancy-ish dress to wear! 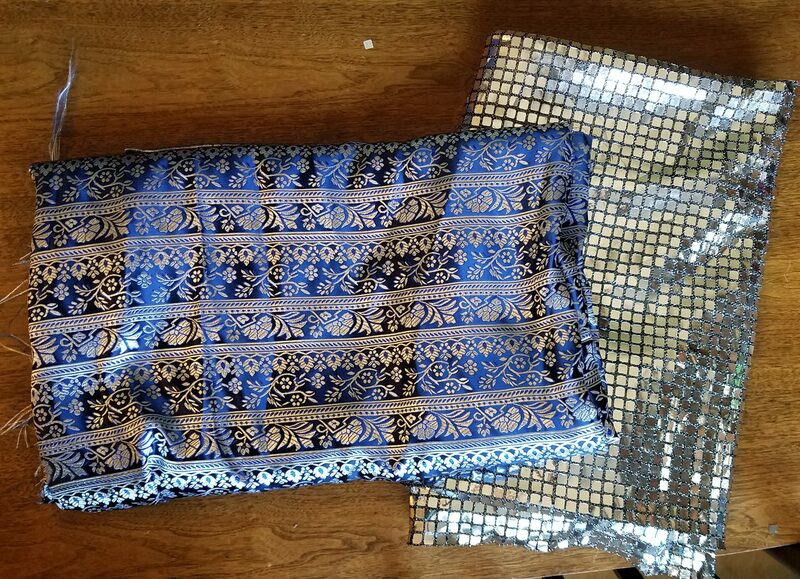 I am making the Timeless Tunic from Patterns for Pirates out of this lovely black and turquoise boho Rayon Challis from So Sew English Fabrics. Todd’s mom gave me one of these for Christmas one year, and I love it! Unfortunately, everyone else in our house loves it, too, so I rarely get to use it. I am going to make several more using this TUTORIAL. My mom made an offhand comment recently about liking them, so I will make a couple for her and my dad, as well. Emma wore one of the Maggie dresses I made for Harley to Harley’s graduation, and really liked the way it fit, so she asked me to make her a couple. She has chosen these four fabrics. The pattern I am using is the Maggie Top, Tunic, & Dress by Bella Sunshine Designs. My parents go camping with their fur-baby, Tillie, nearly every weekend in the summer. My mom paddles around on her inflatable kayak, and my dad spends a lot of time fly-fishing in his float tube. They have a nice little trailer that is perfect for their adventures in the mountains, so I am making each of them a shirt with this panel. 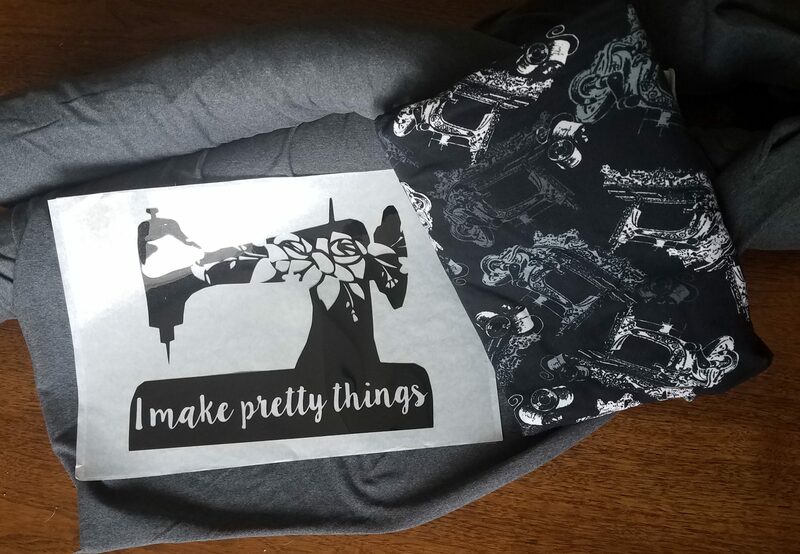 My dad’s shirt will be made from the Patterns for Pirates Men’s Henley, and I will use the P4P Sweet Tee for my mom. 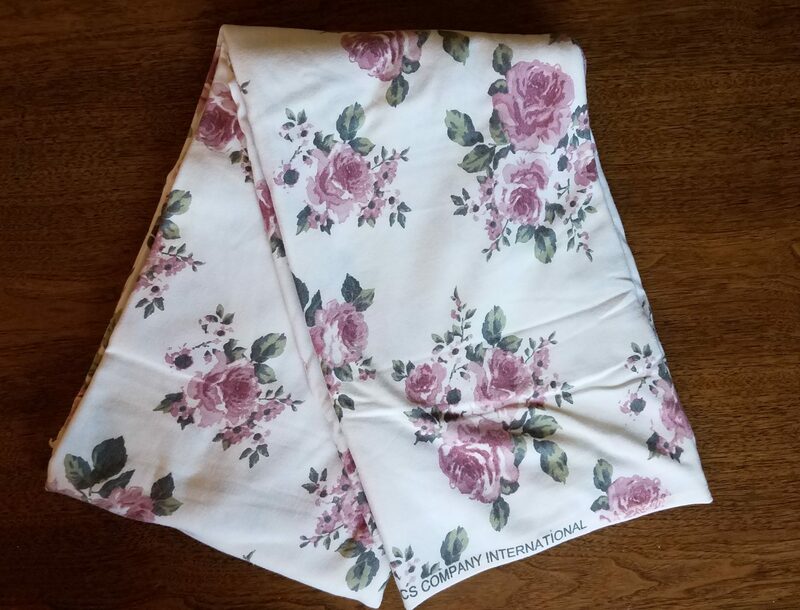 I have this iron on from Katy at Thread & Grain, and I think it is a perfect match for my sewing machine fabric from So Sew English Fabrics. 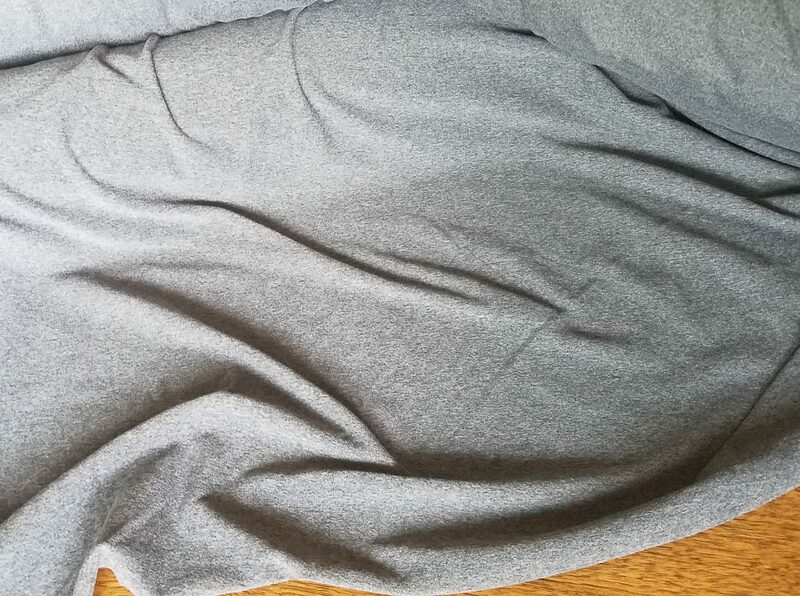 The charcoal DBP is going to be the body and the sewing machines as the sleeves and bands on a Patterns for Pirates Slim Fit Raglan. 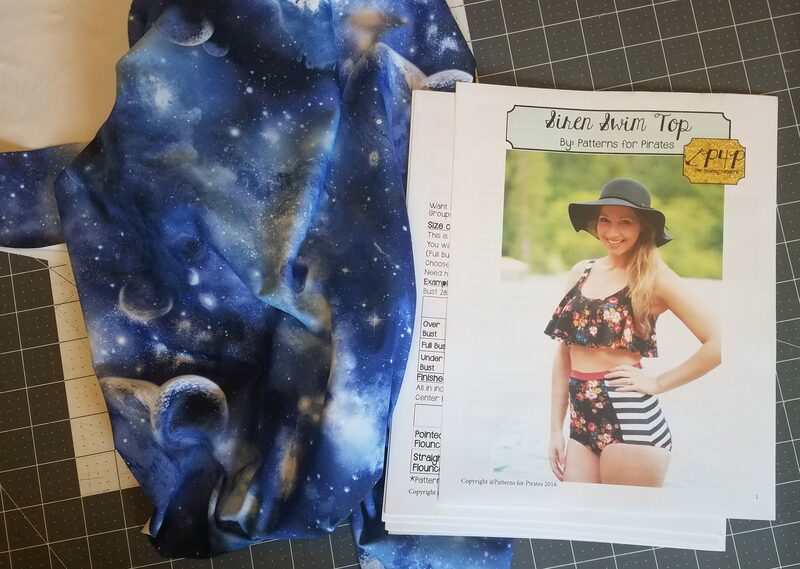 The Patterns for Pirates Siren Swim Top is adorable, and I am in need of a better fitting, more supportive swim suit. I am actually making two of these since I have never made this pattern before. 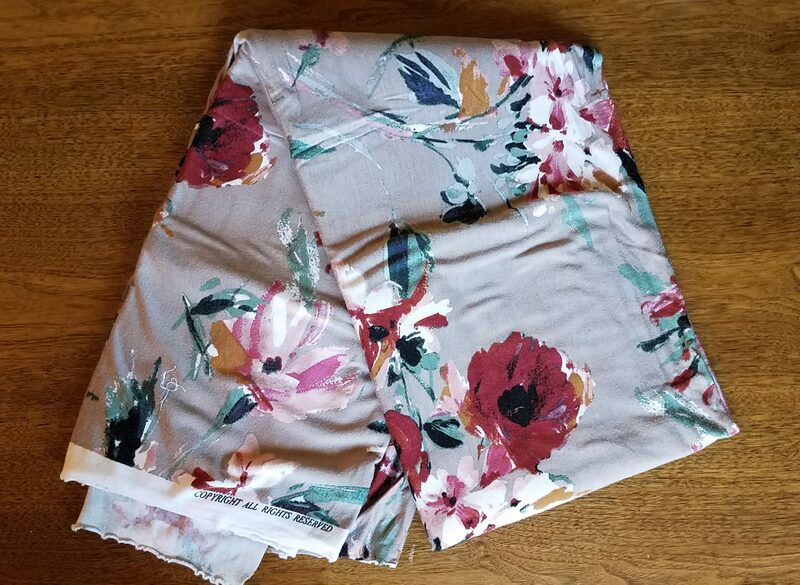 This is my practice fabric. 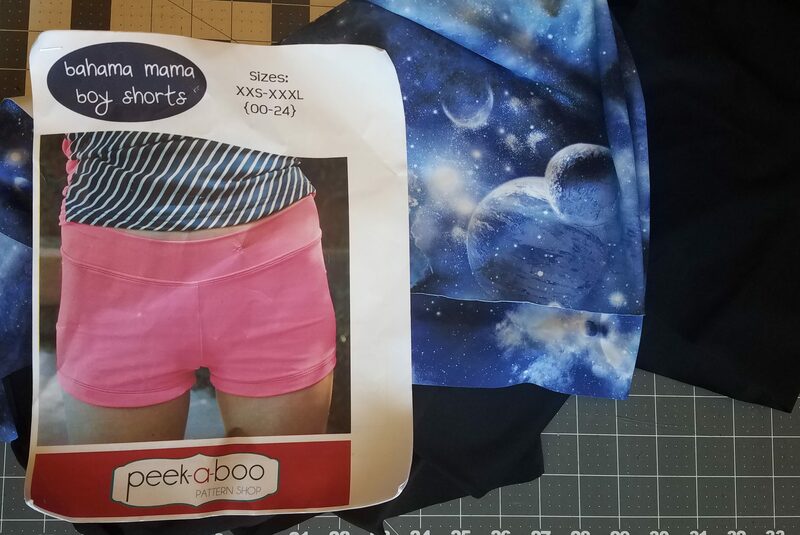 I am going to pair these Bahama Mama Boy Shorts from Peek-A-Boo Pattern Shop with the Siren Swim Top I make. Now that our crazy busy spring is over, I am hoping to get started piecing this quilt. All the pieces are cut and squared, so it is just a matter of piecing them together. 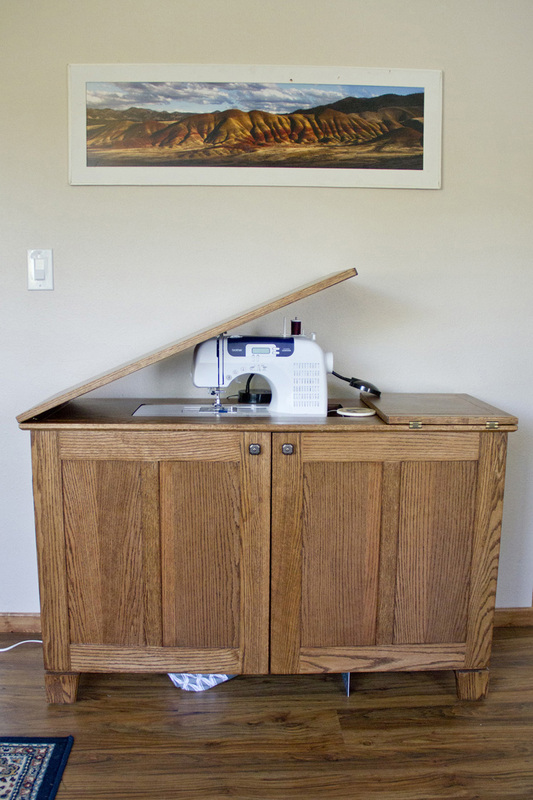 Last fall my sewing machine quit working. I frantically tried everything I could to get it working again, including cleaning. I do clean it regularly, but it was still very dusty and covered in lint. This is how I store it the majority of the time because I use it constantly. I have decided that it needs a cover for when I am not putting it away completely. I am going to use this pattern and tutorial from Bloom and Blossom. Normally, I wear leggings with my costumes at camp, but I struggle with them staying up and not falling down. I want to make myself a pair of breeches out of this pretty brown velvet for our next camp. To go with my new breeches, I must have a new shirt, of course! 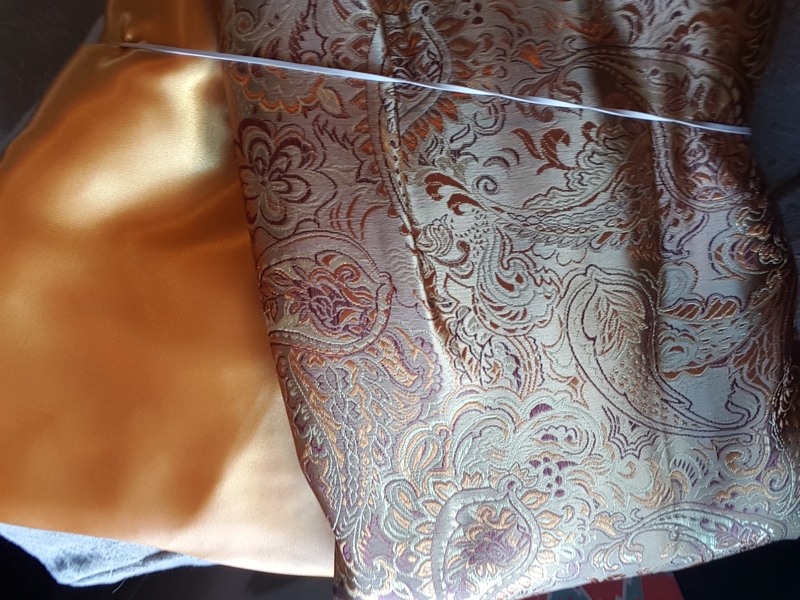 I am making it using the gold satin, and I am using the brocade to make a doublet/vest to wear over the blouse and breeches. 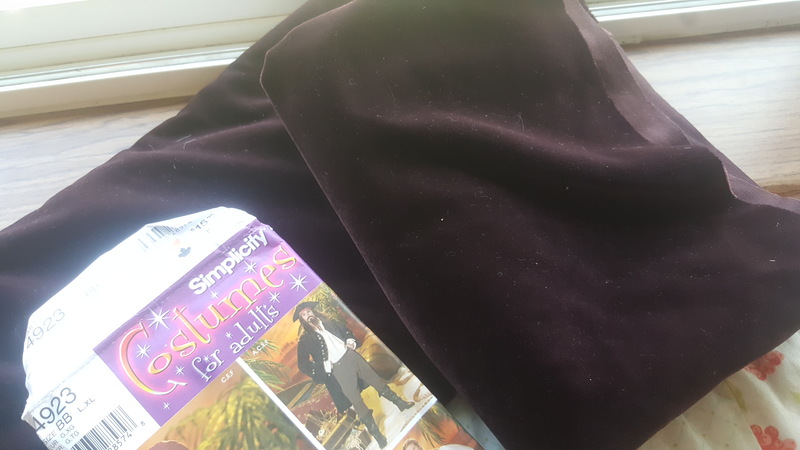 I found this lovely blue crushed velvet on clearance at Joann’s, and I decided I needed a floor length or longer cloak for LARP! I can’t wait to get it put together! I don’t have a pattern for this because it doesn’t require one. In our LARP, magical energy is measured in “mana”, and each caster has a certain amount of mana they can use before having to rest or “refuel”. In order to keep track of how much mana we use, we wear beaded strings that allow us to move beads one at a time to the “used” end; they’re built much like a golf stroke counter. I have the beads already, I just need to get them strung before our next camp. Similar to the Mana Counter, I don’t have a pattern for Spell Packets. However, they are made using 8″x8″ squares and birdseed, so they don’t require a pattern, either. Todd has been wanting a new doublet for his LARP character, Lazero, for a while, but he was very specific about what kind of fabric he wanted (real woven brocade, not printed), and I finally found some. His character is also a bit eccentric, so the mirror squares are going to be the doublet lining. I am making this hat out of a thicker upholstery suede so it can be shaped, but I can’t get to the fabric currently to get a picture. Oops. Todd and I have both increased the number of spells/arrows we are able to throw, so we both need more spell packets. 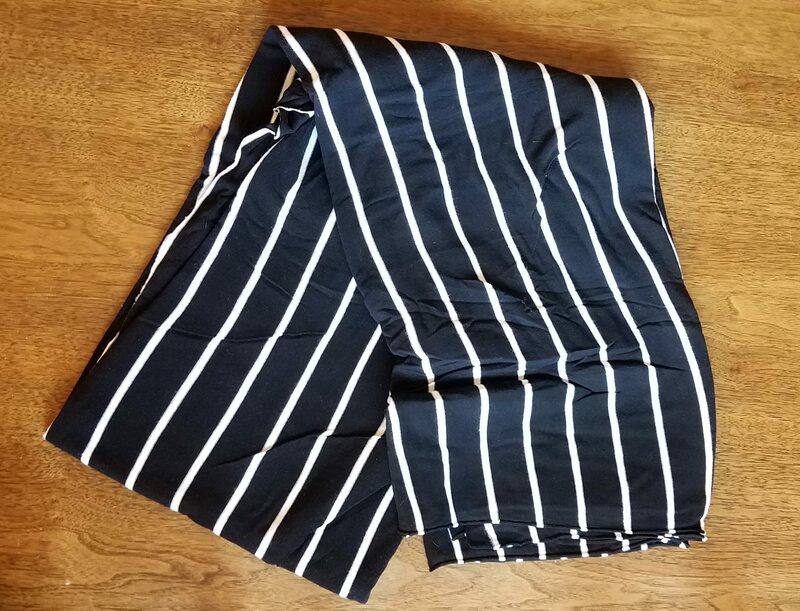 What are your sewing goals this quarter? Great list and so many beautiful garments will be made, I just know it! Thank you for linking up on behalf of the global 2017 Finish-A-Long hosts.